Lake Louise is a magical place to spend some time. Whether you want to check out the slopes in the winter or go hiking in the summer, put Lake Louise on your list of places you just can't miss. It has something for everyone, so allow yourself the time and plan some activities and fine dining. 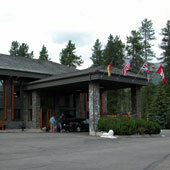 The Deer Lodge is a Canadian Rocky Mountain Resort Hotel featuring 73 smoke-free rooms with radio, (no TV! ), and coffee maker. Located four km from the Village of Lake Louise, this log structure with antique furnishings is just a short walk to the famous lake. Enjoy the on-site restaurant for breakfast, lunch or dinner and, in the evening, the bar. Hotel amenities include spa tub, steam room, sauna, pool table, library as well as complimentary internet, and laundry facilities. 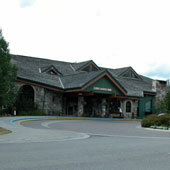 Free parking, ski storage and shuttle available. There is a $25.00 charge for each additional person 12 years of age and over. 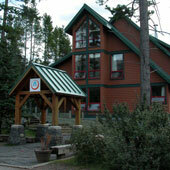 Please Note: Deer Lodge will be closed October 8, 2007 and reopen on December 7, 2007. 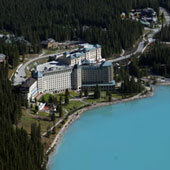 The Fairmont Chateau Lake Louise is situated on what is probably the most popular landmark of the Canadian Rockies, the aqua-coloured jewel of Lake Louise. This luxury hotel has much to offer and the prices reflect this. From first-class shopping, to outdoor activities, and finally exotic spa treatments, this hotel can offer you an experience you won't soon forget. Special rates and packages ($249 and up) are available on their website, if you would like to spoil yourselves and somehow want to make this happen! Room amenities include clock radio, cable television, pay movies and video games, video express check out, ceiling fan and windows that open for fresh air, coffee maker and kettle, hair dryer, iron and ironing board and refreshment center. Hotel facilities include a health club, spa and pool and if you are interested in outdoor activities during your stay, there is a large variety from which to choose. Laundry services, babysitting and ski storage are also available. The Chateau offers you a variety of terrific dining possibilities in any of their lounges or dining rooms. Recommended by the popular travel guide “Let’s Go”, the Lake Louise Alpine Centre is located in the heart of the village of Lake Louise. This makes it very easy to get to for people visiting Lake Louise and yet wilderness activities are virtually at your doorstep. 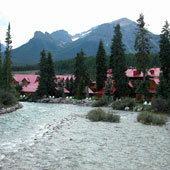 (You can find the other hostels, more remote, on the Lake Louise Hostels page.) This accommodation has standard as well as family and couple rooms. Hostel amenities include two self catering kitchens, sunny outdoor patio, cozy fireplaces, a sauna, fully licensed cafe (fair prices and great food - locals secret!! ), laundry facilities, meeting areas, internet access (free Wi-Fi), ski and luggage storage, library, parking, HI-Lake Louise Alpine Centre is a joint venture between Hostelling International and the Alpine Club of Canada. This facility is wheelchair accessible. 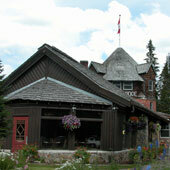 With ten styles of rooms, the Lake Louise Inn has something for every budget. The guest can choose from standard and executive rooms to family and loft suites. Room amenities include cable TV, telephone with voicemail, clock radio and coffee maker. Hotel amenities include a heated indoor pool, whirlpool, steam room, gift shop/newsstand, arcade games, laundromat as well as ski storage and lock-up facilities. Conference and wedding facilities available. Cafe, lounge and restaurant on site for your convenience. AMA/AAA discounts available. 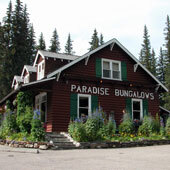 Just a kilometer away from Lake Louise nestled among the pines, Paradise Lodge and bungalows offers their guests a cozy mountain experience. There are individual cabins with private access and parking as well as two buildings of lodge suites offering one and two bedroom units with and without kitchens. Amenities vary with cabin/suite choice but include Jacuzzi, kitchen facilities, fireplace, TV, convenience area with refrigerator, microwave, coffee maker, TV, deck with view, balcony. You would never know that the cabins were built in the 30's since they have been beautifully upgraded. Three- and five-night specials available. The historic Post Hotel is renowned for its fine dining and an award winning wine cellar - not to mention their beautiful rooms, suites and cabins. Situated on the Pipestone River, you can recognize the Post Hostel by its brown log structures and bright red tin roofs! Amenities vary with accommodation choice but include whirlpool tub and riverstone fireplace. Enjoy the cigar room or the piano bar and don't forget to spend some time at their famous spa! (It is recommended that bookings for spa treatments be made prior to your arrival.